This page describes how to use coreboot on the Mitac 6513WU board. 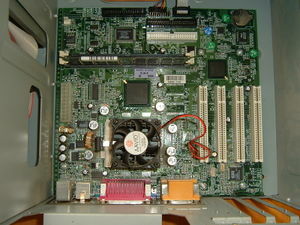 A sample boot log of the board running coreboot is available. SDRAM WIP Works with a double-sided 256 MB DIMM (Infineon HYS64V32220GU-7-C2). Single-sided DIMMs in slot 0 should work fine. Other combinations may or may not work, this is WIP. ACPI No There is no ACPI implementation for this board, yet. Poweroff No Probably needs ACPI in order to work.